The Hotel industry is becoming more and more important every day, it’s expanding due to the large bloom in tourism and leisure. With so many hotels, every little detail can be a deciding factor in whether the guest stays at one over the competition; this means the hotel has to offer the best quality products they can and also amenities for the guest to feel comfortable and at-home. Depending on the class and type of hotel, the products they offer vary. 4/5 star hotels can offer bathing suits, luxury slippers or even electronical devices to their client. On the otherhand, hotels with 3 stars or less might not even offer an item as important and essential as slippers. While it may seem like a trivial item, most hotel guests agree that it provides a very gratifying feeling to arrive to your new room and see a pair of slippers waiting for you to wear them. Now, while there are still some (fewer and fewer as times passes, thankfully) hotels that continue using plastic slippers so that they don’t have to provide new ones for each customer, this has proven to be very unsanitary as it can provide a great deal of diseases. WIth a disposable slipper you can avoid these problems, and provide the guest with a pair never worn before ones. Another great reason is because no matter how clean your hotel floor is, guests will never be comfortable to walk around barefoot, and to avoid them from slipping by just wearing socks, it’s great to be able to provide non-skid sole slippers. They’ll feel warm, soft and comfortable! And because they’re disposable you don’t have to worry about cleaning them afterwards, they can be offered to the guests as a gift (even though mosts guests take them anyway). In Caractere we have many different types to offer, according to our clients needs. From our STANDARD slippers, which is very affordable for any and every hotel, and while it’s our simplest slipper, it’s very high quality and will be liked by anyone who visits the hotel; to our PRESTIGE slippers which are the most high quality of the bunch, they have a velvet-like touch and a thicker sole than the others, they´re truly made for luxury hotels and have guests raving about them.The majority of our slippers are customizable; we give the client the chance to pick what colors they want (from the ones we carry, otherwise we can make slippers of a specific color if the client is willing to order our standard minimum quantity for special orders), the piping colors, the thickness of the sole, logo, etc. New dangers and effective solutions to address exposure to bacterial contamination that can occur when using VR headsets, headphones and / or microphones. The habits of modern life, the evolution of the industrial market and also areas such as, entertainment and medicine, increasingly require the use of new technologies like VR headsets, headphones and microphones. These work as extensions of our senses and our perception. They are now being used in psychology and medicine, they have begun to use virtual reality for therapeutic purposes: to treat anxiety, fear and even trauma for the rehabilitation of patients with strokes. One of the most popular uses of this technology is in the video game field, in which they are beginning to become aware of the risks of hygiene that it can cause. In the work field, a large number of headphones and microphones are used in places such as call centers. Headphones are also popular in spas, hairdressers, beauty centers, tourism, etc. Managers and directors of these establishments are cautious and careful with their employees and customers, for whom they want to ensure a good level of hygiene, choosing what the market offers to meet the new needs created by the use of technological devices that come in contract with the human body and is used by many people. Caractére, has a large number of European customers in this area. In our experience, the list of places and purposes for which technological devices are used is very long and includes a wide variety of situations. -Headphone cover: With elastic boders, white or black, made of non-woven fabric. We offer different sizes that fit most audio devices. Before buying, it is advisable to measure the headphones and get in touch with customer support if you are not sure; the reason behind this being that they are non-returnable and non-refundable. 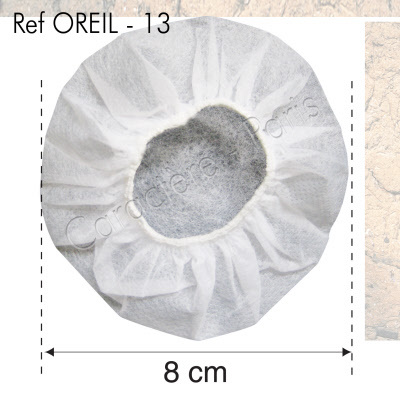 – Disposable higiene masks for VR headsets: Soft, pleasant to the touch, easy to use and convenient,with an original design and individually packaged in sealed sachets. They do not contain latex. (Samples available upon request). -Spray Microphone: Easy to use, no need to rinse after it’s use. No chlorine, aldehyde or phenol. Bactericidal, fungicidal and virucidal action. In cities where there is mass tourism, there is an increasing need for efficient solutions to avoid possible contagion amongst people. As this could lead to the spread of diseases,which can also occur in airplanes, trains, libraries, universities and all those places of transit, which are usually inhabited by many people. Directors, managers and anyone who runs such facilities should ensure a high level of hygiene, and in is this type of circumstance, Caractere can offer help.